Amazing Adaptations: Turkey Vulture /Hawks Aloft Inc.
“Nature’s Garbage Disposal”, the Turkey Vulture is a carrion specialist. They have some unique adaptations for their vulturine lifestyle. Their naked heads remain cleaner when feeding inside large carcasses. They do not acquire the signature red color on their heads until they are adults. As they age, they acquire a number of spots, or beauty marks, on their heads. Juveniles have black heads with no beauty marks. Another adaptation for locating dead animals is their highly developed sense of smell. They can locate carcasses in dense forest by scent alone. In areas where Black and Turkey Vultures co-exist, Black Vultures, with a lesser sense of smell, often follow Turkey Vultures in the hopes of finding food. Unfortunately, some people find pleasure in feeding junk food to wild animals. Hot dogs, which are full of chemicals and preservatives are not an acceptable food for any wild animal, including vultures. 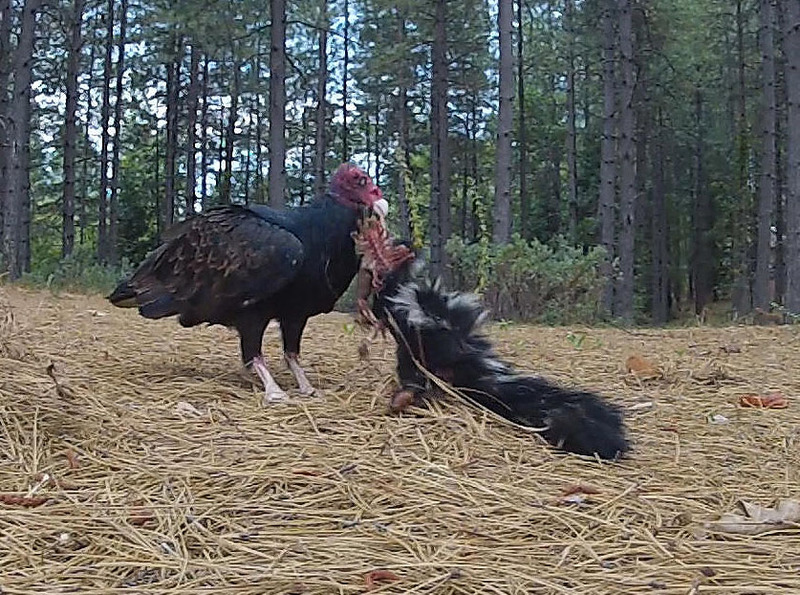 Raptors and vultures must consume all raw portions of the animals they eat to obtain the necessary nutrients. This includes the bones, fur or feathers, internal organs, etc.